Day two of 2017 and we're off with our first movie review! 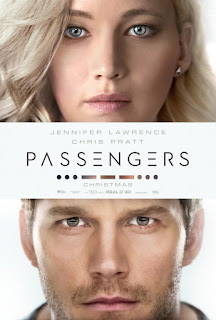 A big budget, big star movie of a story of a ship of 5000 people on a 120 year journey to Colony II planet, except James (Pratt) wakes up 90 years too early. Stuck with a robot bartender as his only company he also wakes up Arora (Lawrence). So the first part of the film is a bit of a love story, but then disaster hits, but it only feels like a minor disaster as its taken so long to get here. And this is where the film falters, it has great sets, great actors and a fairly good story it just seems too long and drawn out. Shame really, bit of editing or a bit more going on the ship and it might have been saved. All our 2016 movie reviews are on our Movie Reviews 2016 archive page. We actually had a film this year be our same number one as 2015: Star Wars: Force Awakens. As we saw it on a normal screen in 2015 and IMAX in 2016 and both times gave it 10 out of 10, in the interest of fairness, we actually skipped this from our top 10.